Hello everyone! Recently I've been trying to get back into making YouTube videos, since I've kinda dropped off the face of YouTube for awhile and only pop-in every other month or more with one video. Yikes! Anyhow, I've filmed a holiday makeup look featuring a burgundy & rose gold eye look [kinda my go-to look right now, though I'm kinda testing out some new drugstore products right now] and I did a Christmas OOTD collab video with a long-time YouTuber friend of mine, Yelena -- so fun! Come January I really want to try to film & upload a video at least every two weeks. If I can do more, great! I want to share product reviews, makeup tutorials, outfit videos, hauls, and maybe some other kind of fun videos. So if y'all have any suggestions of what videos you would like to see, let me know! Wet 'n Wild Shadows: Use both the Walking on Eggshells & Knock on Wood trios. LORAC Unzipped Palette | Shades: Unreal, Unbridled, Unconditional, Untamed. I have a fun quick little giveaway to do with y'all today! Tee Blox is offering the first month free to three of my subscribers [you get to pick which box you want]. 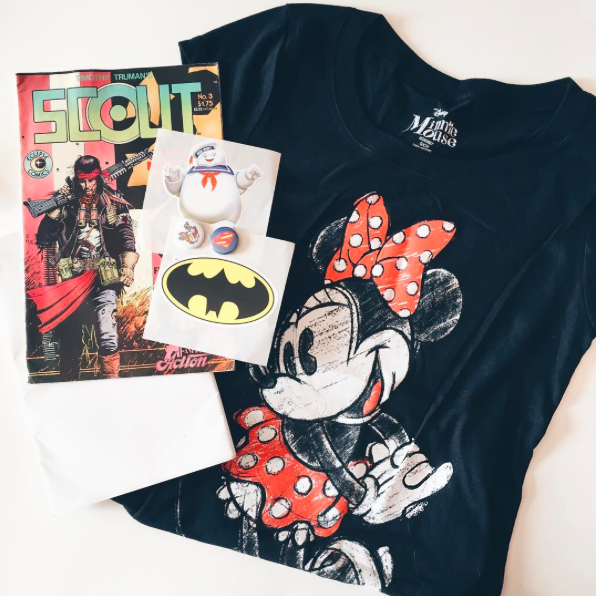 If you are a nerdy kinda gal [or guy] who loves graphic tees that in any of the following categories: Disney, Marvel, DC Comics, Star Trek, etc... you may want to enter this giveaway. How to win? Leave a comment with which box you would subscribe to and/or what kind of product reviews and/or makeup tutorials would you like to see. Bonus Question: Which box should I subscribe to next year? Marvel or Disney? I saw Tee Box when you first posted it on Instagram and thought it was the coolest thing EVER!! I would TOTALLY subscribe to the MARVEL one.....MARVEL fan ALL THE WAY:) As for a video, I would love to see something about doing/how to add "Cat Eyes" without your makeup look being overdone! P.S. best way to contact me would probably be through email or Instagram. Personally, I would definitely go for the Marvel box, and cross my fingers for a Captain America tee ;) And I think you should probably do the same, can't ever have too many superhero tees! I think I would have to go with the Disney box. :) Thanks for the chance to win! Happy to see you getting back to YouTube! I've always really loved your haul videos, so it would be awesome to see more of those in the future. Tee Blox sounds really cool! Without a doubt I would choose Disney. I love the Marvel box! I would go for the Disney box! I love Mickey and Minnie! Also, I love make-up vids! I would love to get the Disney box, though it would be a close decision to the Marvel one! I'd love to see more make-up and OOTD videos! Maybe some hair style videos as well? Thanks for the giveaway, and have a lovely New Year! I would choose the Disney box. Thanks for the giveaway! Disney would be my choice. I think you should totally go with Disney too! :) Thanks for the giveaway! I would prefer the Disney box. how fun!!! i'd definitely want the marvel box!! and you should too! I would definitely choose the Disney box. I think I'd go with Star Wars and I'd like to see a makeup tutorial for beginners.